Melini Hotel Restaurant, immersed in the green of the Appennino Tosco Emiliano,offers you a relaxing sojourn away from the frenzy of modern living and in direct contact with nature. We have 13 rooms, all comfortable furnished with private bath, telephone, and color T.V. After a walk in the woods, you can enjoy a relaxing time in our resplendent garden or on our ample terrace overlooking the Reno river. 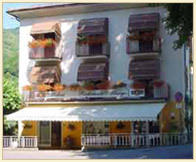 Melini Hotel Restaurant is at 24 km from Pistoia, 57 km from Florence, and 75 km from Bologna, Pracchia is linked to these cities by a comfortable train line. Moreover, the railway line "Porrettana, one of the most famous and ancient of Italy, connecting with the notes Pracchia spas of Montecatini Terme (30 min.) And Porretta Terme (18 min. ).